Studio is booked daily and hourly with engineer. A studio day is 8 hours but additional time is often possible and will be charged for accordingly. Session time must be stated and agreed to at the time of booking. Minimum charge is 2 hours at £30 per hour. 50% non-refundable deposit is require to reserve studio recording time. The balance is due at the completion of the session and the final bill must be paid in full before any files or media are released. Payment is accepted via cash or card. Please note that if paying by card a 3% processing fee will be applicable. We accept no responsibility, legally or financially, for any articles brought into or left at the studio including master tapes, media, instruments & personal items. We reserve the right to cancel or re-schedule anytime without notice or prior explanations. If you need to cancel you must give us 48 hours notification. If session is cancelled with less than 48 hours notice the full cost of the session will be charged.  Allowances due to extreme circumstances are made at the prerogative of Berlin Studios. You are permitted to bring food & drink into the rehearsal room but please do not place it on any important equipment. Smoking / Vaping is NOT permitted anywhere inside the studio. We have a designated area outside for this. We accept no responsibility, legally or financially, for any articles brought into or left at the studio including instruments, electronic equipment & personal items.